A woman's shoulder has been dislocated after a pickup attempting to park near Avid College in capital Male' hit the woman. In the incident that occurred on Sunday morning around 10.40am, the pickup hit the woman while the woman and another man were sitting on a motorcycle parked nearby, while attempting to park the vehicle. Upon impact, both the man and the woman fell off the motorbike onto the payment below, and the woman's shoulder was dislocated due to the fall. The woman also sustained a cut on her foot. Onlookers report that the pickup lost control and hit a car before hitting the motorbike. The car also sustained several damages. 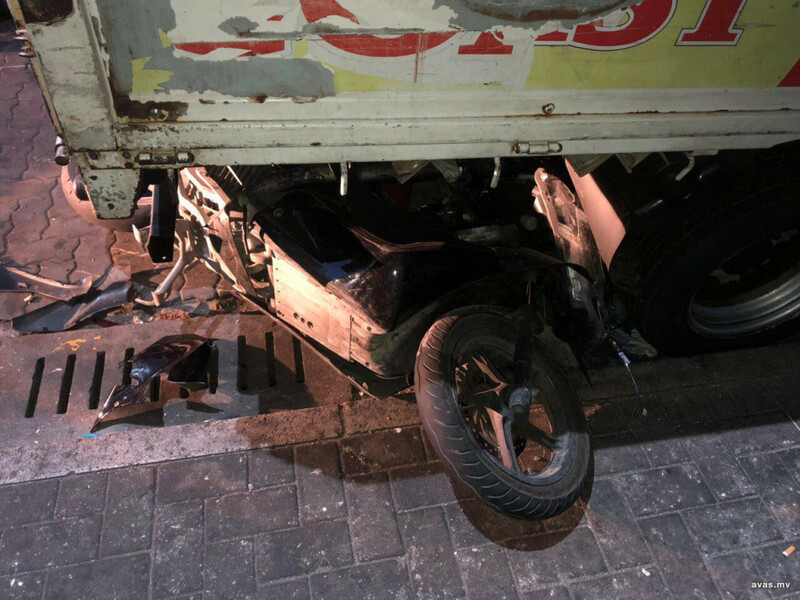 A dangerous accident took place earlier on Saturday night in Male' city. According to traffic police statistics, 58 accidents occurred in the last week in Male' City alone. Seven people were injured in the accidents.